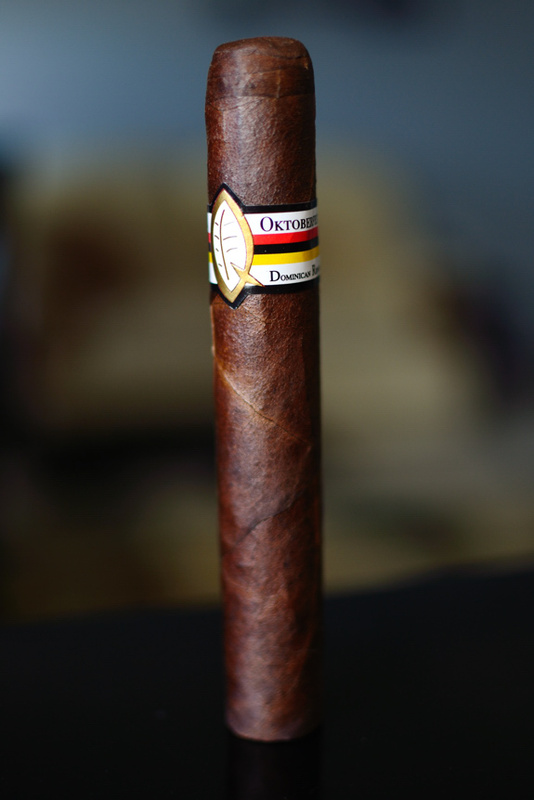 As September comes to a close and October rolls it’s head around the corner, I felt it was time to get the review of the Quesada Oktoberfest all taken care of. 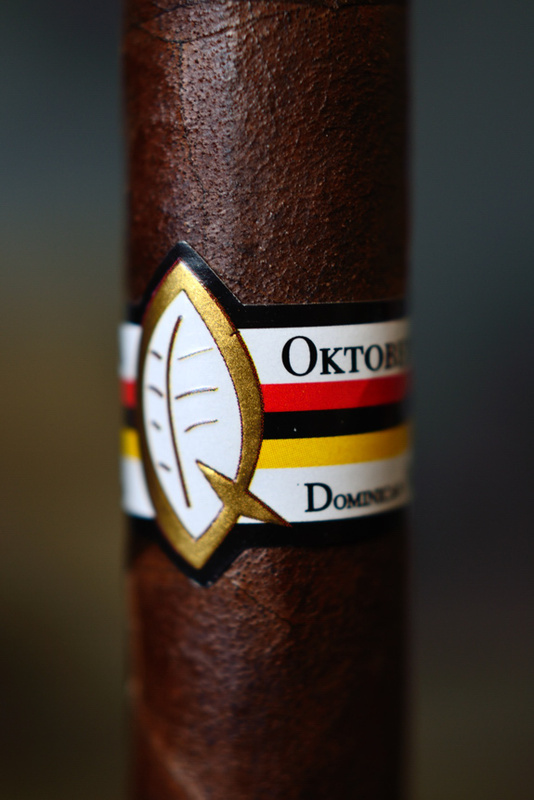 The Good Stuff: Quesada’s Oktoberfest is the newest offering by Manuel Quesada. If you’re like me, one thing comes to mind when you hear the word “Oktoberfest”. Beer. Well, beer and bratwurst, but beer first. And that was Quesada’s angle when they created this cigar. A blend that would pair perfectly with a hefty beer. Possible? Who knows. Marketing ploy? Maybe. But let’s dig a bit deeper to see what this cigar is all about. 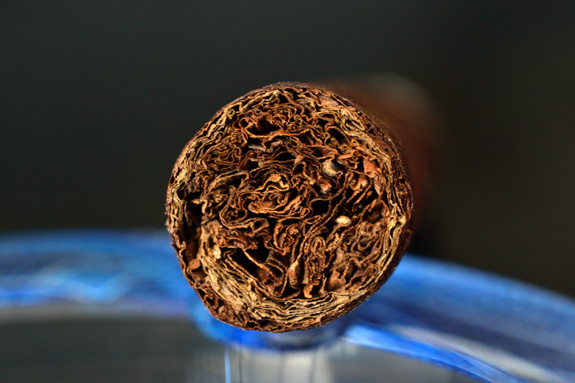 The cigar only comes in 2 sizes, the “Bavaria” which is a 5.5 x 52 double robusto, and a monster of a cigar called the “Uber” which is 6 x 65. The cigar is limited to 500 boxes of each size and will run you between $8 and $9.50 a stick. These were purchased from “La Casa Del Puro” my local shop/lounge. 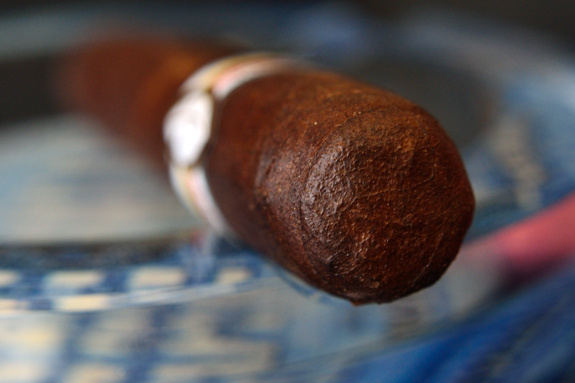 Prelight: Now this is a dark cigar. The wrapper on the Oktoberfest is almost pitch black in some spots, and a very dark-chocolatey brown in others. I love seeing inconsistency in color on darker wrapped cigars, it leads me to believe that they are all natural in color and not dyed. This is also on extremely toothy, and oily cigar. What fine specimen. You can see the sun glaring more from the wrapper leaf than the actual band of the cigar. There are a few larger veins running the length of the cigar that I hope don’t pose a threat to the burn and overall experience. The toothy sandpaperesque wrapper then leads into a really stubby double wrapped cap. Seriously, skimming the thick and solid cigar body with my finger feels almost like rubbing my hands on sandpaper. This cigar is thick, heavy, and hard as a rock. 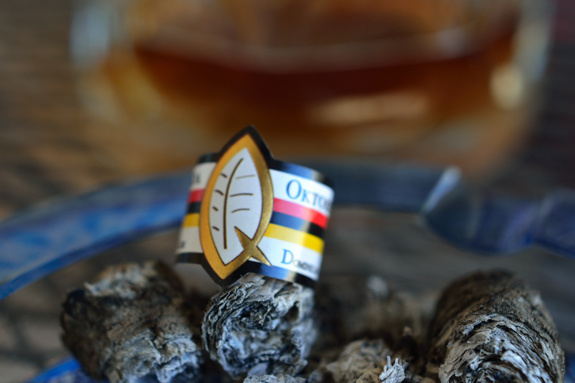 The band on the cigar carries a similar overall design that Quesada always uses, but with a nice German flag accent running the entire ring of the band. The big, pronounced, gold embossed “Q” logo is neatly laid in the center of the band is accompanied by some simple back text with the words “Quesada – Oktoberfest – Hand Made – Dominican Republic”. 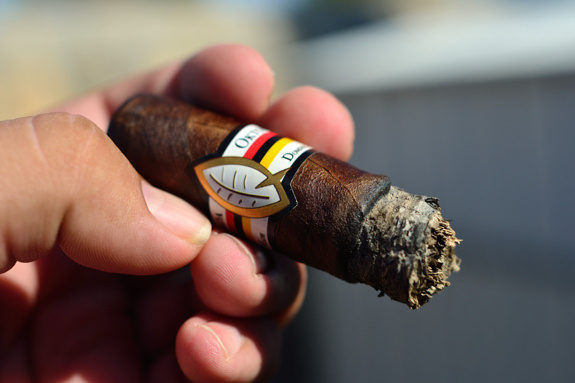 The wrapper of Quesada’s Oktoberfest gives off little more than a subtle cedar and tobacco mixture where as the foot of the cigar is a very, very strong cedar and spice. It smells a lot of the scent of the inside of a brand new humidor with just a sharp little spice kick at the end. The Oktoberfest clipped cleanly and easily with my double bladed Palio cutter. The cold draw give fourth a nice, smooth, welcoming cedar and spice flavor. Pretty much an identical match to the aromas I picked up in the prelight. First Smoke: I was almost expecting to be greeting with a nice pepper kick, but was really surprised when the Quesada Oktoberfest started out with a very smooth, Earthy, Cedary, nutty, spicy flavor profile. The spice is really neat, it’s almost floral with a very sweet undertone. The Oktoberfest really doesn’t give out much stationary smoke at all, but it smells incredible. Like a burning garden, or some lightly scented potpourri. The draw on the Oktoberfest is very easy, but not too loose pumping out a HUGE cloud of thick while smoke. And when I say thick, I mean VERY thick. The heavy cloud of smoke takes forever to dissipate. The burnline is very thick and even for the most part, with some larger, not-so-deep waves on one side. The ash left behind is this interesting dark grey and black and extremely tightly compacted. 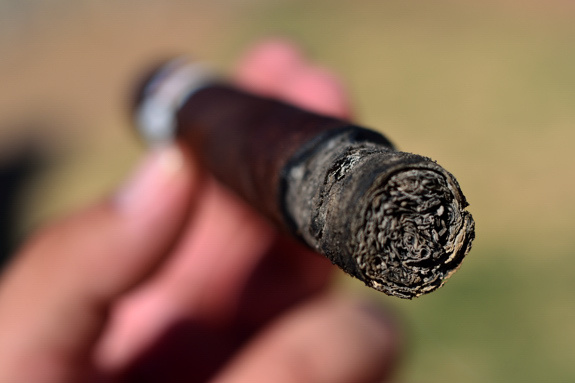 It’s very rare that I see ash this dark in cigars. I read once, somewhere, that this shows the lack of magnesium in the soil in which the tobacco was grown. I have no idea what this even means, but it sounded smart. Halfway There: Oddly enough, a little of that pepper did in fact sneak into the second half of this Quesada Oktoberfest, but it bowed out just as quickly as it appeared. The flavors are still pretty smooth and consistent. The cigar is weighting in heavily in the cedar area with some sweetness, bittersweet chocolate, and some pasticcio mixed in there. The burnline is still a bit wavy, but I haven’t had to touch up the cigar or relight it. The retrohale is really sharp and coats your nasal passage with a very floral, strong earthy type prime. I am starting to feel a bit of body from this cigar already. Nothing too crazy, but enough to catch my attention early on. Finish: I started to pick up some really neat gingerbread type flavors in the final third of this Quesada Oktoberfest. The flavors switched up quite a bit actually. The cedar is still there but it is now being challenged by some chocolate, cinnamon, and that gingerbread I mentioned. It’s a strange pairing with the fuller body from this cigar, but it makes for a very enjoyable, and smooth finish. There wasn’t any harshness into the final inch. I kept thinking there was going to be, and because of the flavors I expected there to be, but surprisingly there wasn’t at all. The body had a quick ramp-up towards the end, but it wasn’t anything too powerful. Medium/Full at Best. Overview: Now did Quesada really come up with a cigar in which the basis of the blend was all about a better beer and cigar pairing? I doubt it. Reason being is, as it is, Cigars and beer already go perfectly well together. Now did Quesada come up with a blend to celebrate the season while keeping possible cigar and beer pairings in mind? Much more likely. 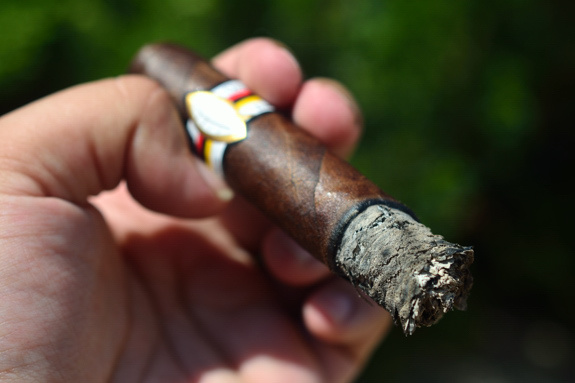 Whatever the case may be, Quesada hit the marks when creating their Oktoberfest blend. The marketing is great, the construction is flawless, the flavor profile is complex and very enjoyable. What more could you ask for? I smoked this cigar both with and without beer and quite honestly, it handled itself very well in both realms. Despite having some body, I don’t think that any novice should be scared to try this cigar and I would highly urge any seasoned smoker to get your hands on these cigars. The overall experience and the price point makes it a great addition to anyone’s regular rotation. Pairing: Obviously I was going to pair this cigar with a German Marzen. I contemplated for a while which one I wanted to shoot for and then decided that I’d go with one of my favorites, Paulaner’s Oktoberfest Marzen. I also decided to drink this out of a full sized Oktoberfest style stein. Couldn’t get much better than that! I am also pretty curious as too just how many beers these steins hold. It’s kinda like the “how man licks does it take to get to the center of a tootsie pop” mystery. Usually during Oktoberfest celebrations, these steins remain full while the party goer drinks filling, after filling. I know I have had my share! So just how many beers does one hold? Four. Well, About 3.75 to be exact, but I had no problem gulping down that extra .25 before finishing the other 3.75. 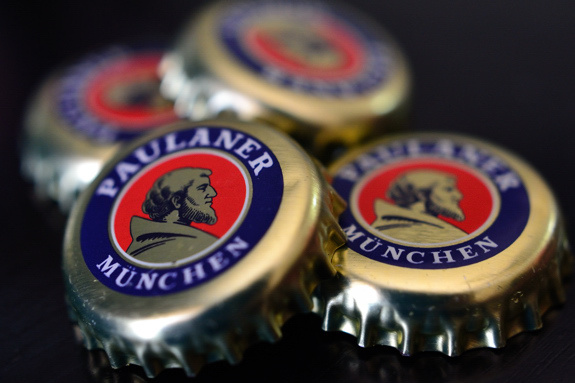 Paulaner Oktoberfest is a Marzen style brew, brewed at the infamous Paulaner Brewery in Germany. What started as a simple seasonal ale has recently blossomed into a full, year round treat. The 6% ABV beer carries a very sweet, yet spicy malt and citrus flavor which really pairs well with most cigars, especially lighter shade ones. The beer made a great pairing with the Oktoberfest cigar, but I think it would go a lot better with something heavier, like a nice porter or a Bruin. Nice review bro. I haven’t seen these in my area yet, but then again I haven’t necessarily gone on a crusade looking for them. Definitely worth a shot based on your review. I will try to pair one with a nice porter just to see if I get a similar experience. Keep up the good work bro. Thanks for the read big guy! If you have any problem finding let me know! Great review and good job on the macro. You’re getting better every day. Great review and great cigar! The Quesada brand is solely done by the fifth generation of Quesada’s. Manolo does not have anything to do with the Quesada brand. Thanks for the read and the info! Quesada isn’t a company I’ve followed too closely in the past few years, but with the great success of all the “Quesada” branded cigars as of late, I feel foolish! True. They are all made by the Matasa factory in the DR along with the Fonseca line. Lots of great stuff coming from there of recent. Ah, to be young again and be able to down four beers at once as if it were nothing. 😉 Sounds like you should have gone to your 1554. Great review once again, but I wish you would quit trying to decimate my bank account with all these great sounding sticks. LOL Nice work with the new camera! I’ve been getting lucky. It’s been a while since I have reviewed a bad stick… but you know what they say, when it rains it pours. Maybe this is the quiet before the storm. My good ol’ 1554 will be right out during the winter. It’s one of my all time favorite go-to beers and during the winter it’s 10 fold! Good review man! Sounds like the last couple of Quesada releases have been off the charts but really hard to get a hold of. I hope they release a regular production line soon that lives up to these expectations. Or maybe it already exists but I don’t know about it since Quesada is a brand I rarely look at? And that pairing is epic! Us Canadian’s applaud your beer drinking ability! You’d fit right in up here eh?! Them be fighting words! Who doesn’t like Demin? Hey nice review! I smoked one of these yesterday and I agree its a good stick. very unique profile. Tony, what kind of shape do you think your readers are? Why? Because they to RUN nit walk and buy thus cigar by the (multiple) box. I smoked one this afternoon and in a word – wow! This baby has some serious cubanesqe aging potential. It’s gorgeous to boot. With only 500-600 “total” boxes made, people are going to kick themselves if they don’t jump on these. Personally, I’m going to buy about 5-10 singles to smoke now and stash the two boxes until next year’s Oktoberfest (2012) and the year after (2013). As I said, I think this cigar has some serious aging potential. Tony, thanks for the great site and articulate spot on reviews. Let me know if you can’t find em man. I found a few Bavarians. Smoked two of them… they remind me a bit of the Liga Privad no. 9…. Not a bad smoke at all. 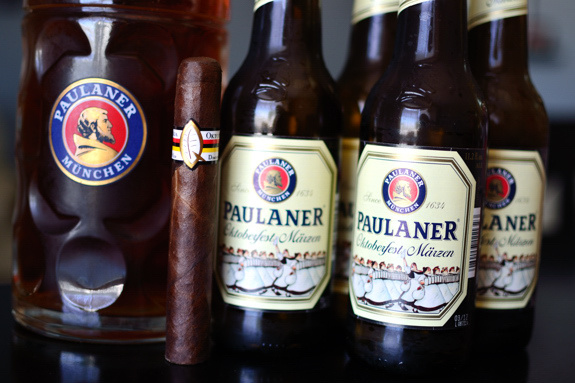 I tried this exact pairing tonight, Quesada’s Oktoberfest isn’t what it was in 2011. There’s quite a physical difference in all the sticks that I’ve had: a lot less toothy and less oily wrapper. The cigar smokes a lot more mildly on whole. Still, great review even though this comment is coming late.